Following Jeremy’s trend today I head out back with an EP Carrillo Dusk and a bottle of the 2018 Founder’s Brewing KBS release. 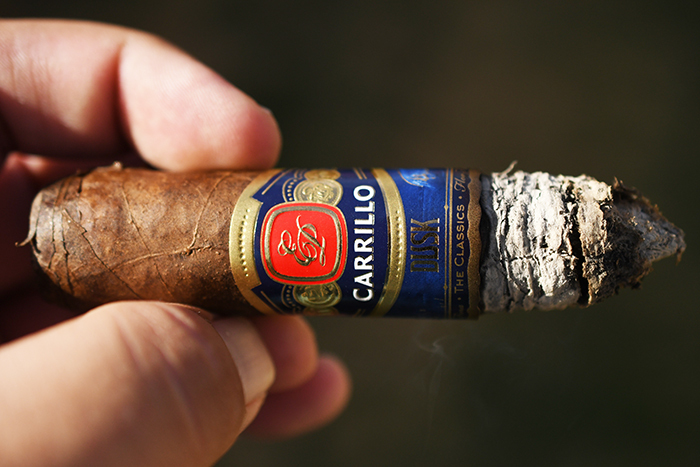 The EP Carrillo Dusk was named #18 cigar of the year by Cigar Aficionado. The Dusk is one of the newer additions to Ernesto Perez-Carrillo’s portfolio making it’s debut in 2016 at the IPCPR show in Las Vegas. 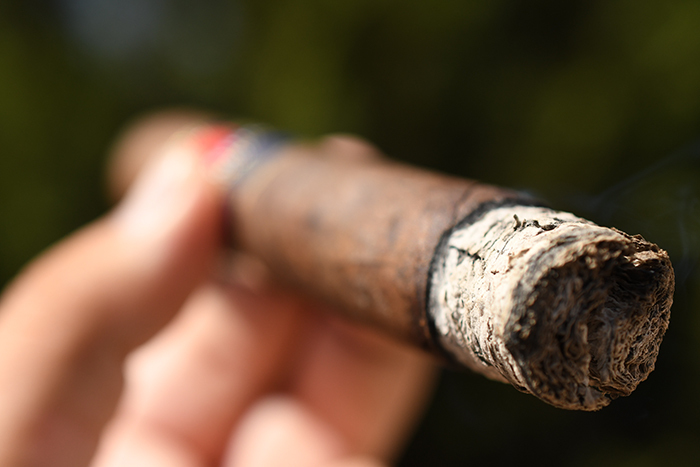 The Dusk is part of the Classics series and is a full-production cigar. 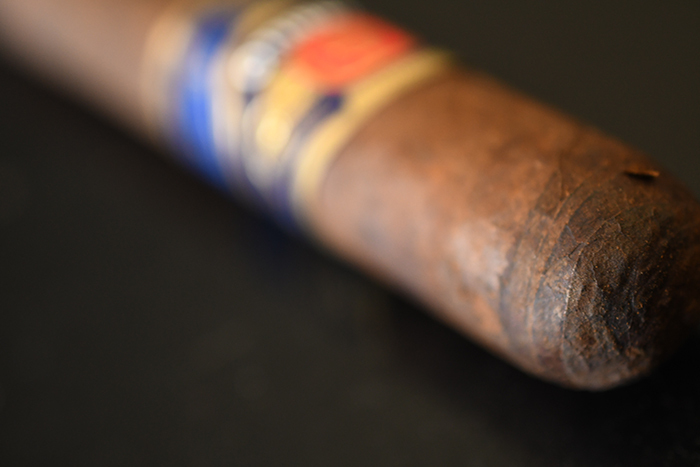 The EP Carrillo Dusk carries an undisclosed Maduro wrapper form the United States, Ecuadorian binder, and Nicaraguan fillers. The cigars are being manufactured at the Tabacalera La Alianza factory in Dominican Republic and come in four sizes: Robusto (5 x 50), Stout Toro (6 x 52), Obscure (7 x 54), and the Solidos (6 x 60). All formats are packaged in boxes of 20 and run between $7.15 and $9.55 a stick. A big thanks goes out to Cuenca Cigar for sending these our way. You can purchase these directly from Cuenca, or as part of their Cigar Aficionado Top 25 Cigars of 2017 sampler pack. The EP Carrillo Dusk is wrapper in an extremely dark brown, “Dusk themed” wrapper which is consistent in color minus the darker natural webbing scattered throughout the wrapper’s leaf. The texture on the wrapper is pretty coarse and toothy with a very large amount of oils coating the wrapper. 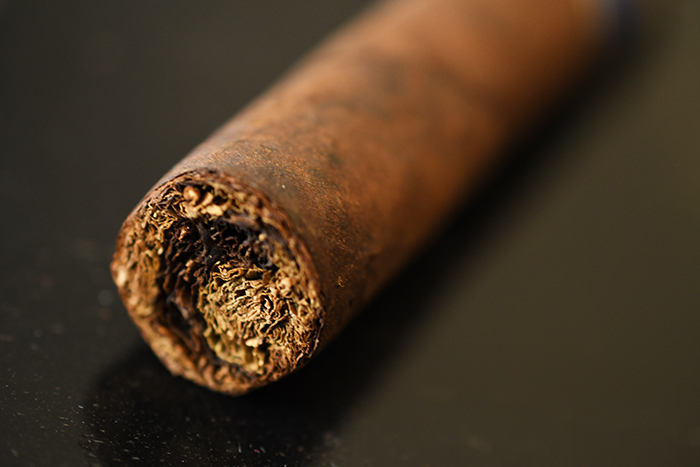 The wrapper feels very thick, dense, and firm while the filler is packed extremely tight resulting in a cigar that feels like a dry erase marker. 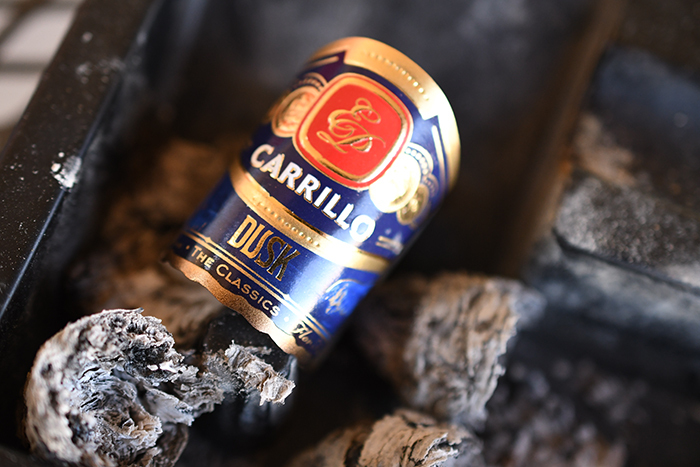 The cigar is then polished off with a round, double wrapped cap and a beautiful navy blue and gold band sporting the EP Carrillo crest and the Dusk logo embosses in the front. The wrapper on the EP Carrillo gives off great cocoa and spice aromas while the foot of the cigar carries much more pepper, spice, and natural tobacco scents. The cap cut clean and easily using my Xikar XO double bladed cutter. The cold draw produces great chocolate, spice, pepper, and dirt flavors. 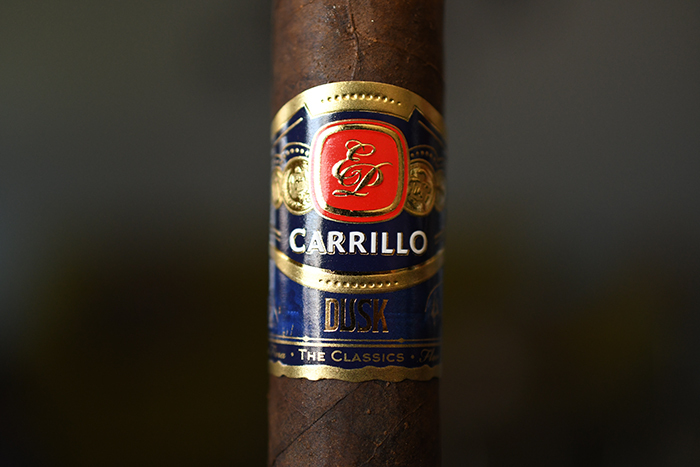 The EP Carrillo Dusk starts out with a blast of black pepper which quickly faded after the first few puffs to reveal a soft palate of dark chocolate, coffee, slight sweetness, brown sugar, and cedar. The draw is great. There is something about larger ring gauge cigars that causes the cigar to release a great amount of smoke with little effort. 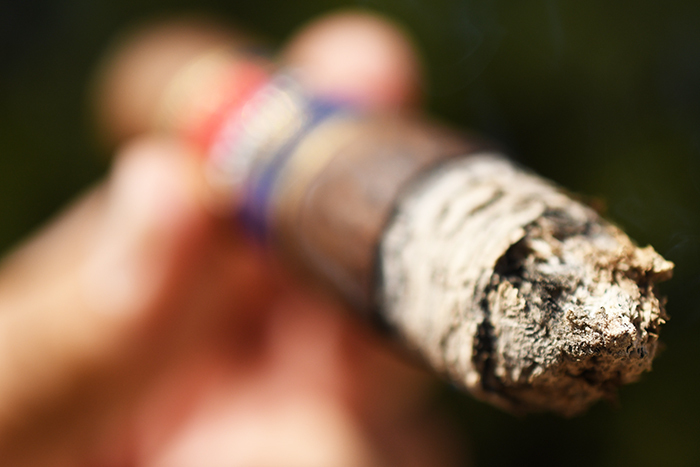 At first, I was scared the cigar would be packed too tightly, but it’s smoking like a dream. The burn line is slightly wavy, but razor sharp. The Ash is decently compacted and medium gray which held on for about an inch before falling into my ashtray. 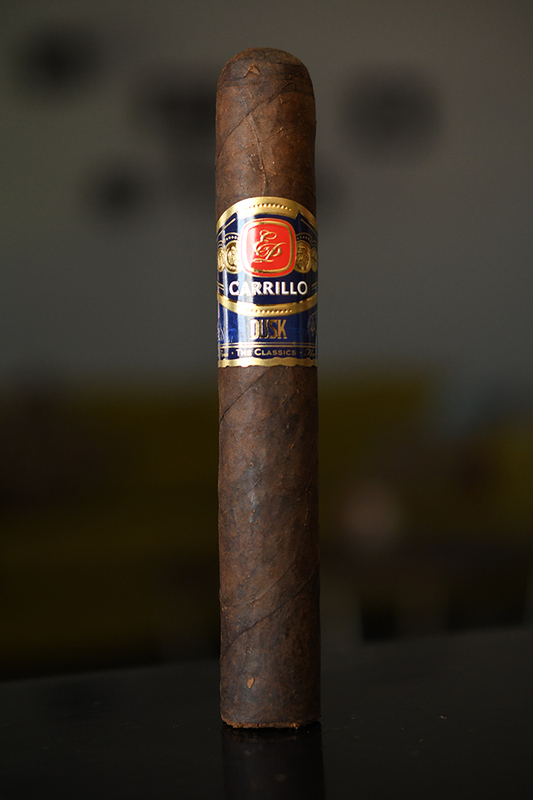 Into the second third of the EP Carrillo Dusk the cedar has really taken the prominent role in the flavor palate backed by dark chocolate, soft coffee and a bit of musk. The sweetness has almost completely faded out. The retrohale is nice and smooth coating my nasal passage with coffee, cocoa, and soft spice which isn’t too prominent in the standard experience. The burnline is still slightly wavy but holding strong as I close out the second third with nothing in terms of nicotine kick. The cedar has really started to overpower all the other flavors in the final third of the EP Carrillo Dusk. While the cocoa, musk, and coffee still remain they really just kind of pop in and out at this point as they battle through the overwhelming cedar flavor. While I do enjoy it, I wish the cigar ended just a bit more balanced. The burn line was a bit wacky throughout but I never once had to touchup or relight the cigar so no marks taken there. I never once experience any harshness nor extended heat in the 2 hours it took to take this cigar down to the nub. I close out with no signs of nicotine at all. I am a big fan of EP Carrillo cigars, but this one just didn’t do it for me. The flavors seemed a bit muted from the beginning and as I hoped they’d ramp up as the cigar progressed, they actually dampened. I smoked three of these cigars and two of the three (not this particular one which came from a different box than the previous two) had a strange metallic flavor throughout the experience. Since it didn’t happen on all of them I didn’t feel right mentioning it in the review, nor dock the cigar marks for that. The burn and construction were great though as the cigar performed flawlessly. So if the above flavor profile matches something you think you’d like then by all means pick it up, and let me know what you think about it. I’d love to hear it. 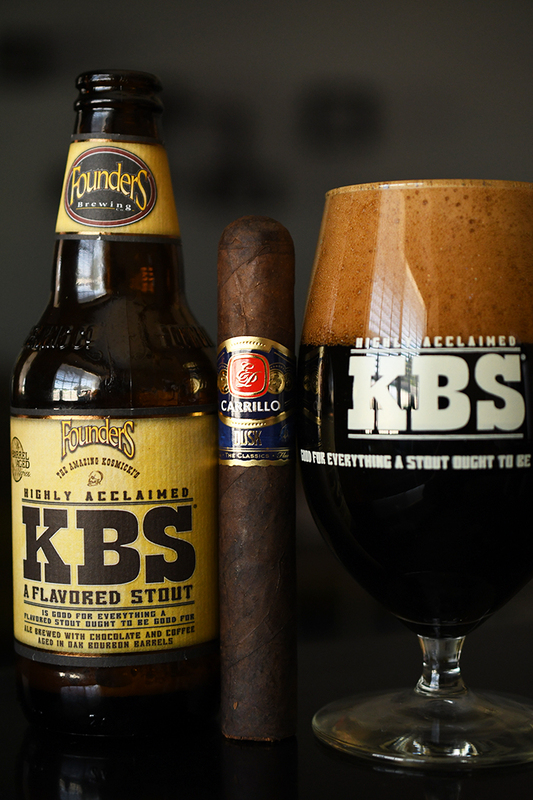 Let’s face it, we all know and love Founder’s KBS. Each year this is one of the most sought after beer releases. Brewed at the Founder’s Brewery in Michigan this Imperial stout with Coffee and Chocolate added is aged is Oak Bourbon Barrels before getting bottled and poured with a 12.3% ABV. KBS starts out with a great amount of sweet chocolate, mild coffee, bourbon bite, vanilla, and malt with a heavy mouthfeel before finishing sweet with more chocolate, coffee, vanilla, toffee, and a slight bourbon bite. The alcohol is very well hidden in this dangerously drinkable stout. I paired it with the Dusk hoping that the complimentary flavors would help pull some more body out of the cigar, which it did, but still not enough to get my attention.